Ken Gregory, best known as the manager of Stirling Moss, has died. After serving in the Second World War, Gregory joined the RAC's competitions department in 1949, which served as his introduction to motorsport. He quickly became heavily involved in the thriving 500cc racing scene, in which Moss was establishing himself (pictured), and Gregory became his business manager. Gregory played a key role in Moss's move to Mercedes for the 1955 season, which allowed his charge to emerge as a genuine Formula 1 star, winning the British Grand Prix and finishing second in the world championship having previously had only one third place at that level. Moss was not initially keen on the move, given his publicly-stated commitment to winning the title in a British car and with potentially clashing commercial deals agreed, not to mention Maserati's disputed claim that it had an agreement with him for '55. But Gregory secured a lucrative deal that would put Britain's leading driver in a top car. Gregory's contribution to motor racing stretched far beyond simply managing Moss. He also managed Peter Collins, who won three world championship grands prix driving for Ferrari before his death at the Nurburgring in 1958. Beyond that, he organised the first car racing meeting at Brands Hatch, previously used only for two-wheel racing, in 1950 and formed the British Racing Partnership with Moss's father, Alfred, in 1957. BRP, which raced at world championship level from 1958-1964, the final two years as a constructor in its own right, only achieved patchy results. Second place for Moss driving a BRP-entered BRM in the '59 British GP was the highlight, although the team did win at non-championship level. It also gave opportunities to a number of British talents, including Ivor Bueb, Chris Bristow, Cliff Allison, Henry Taylor and Team Lotus refugee Innes Ireland (pictured) as well as the very occasional outing for Moss. BRP also fielded several non-British drivers, including Hans Herrmann, Lucien Bianchi, Masten Gregory and Jim Hall. 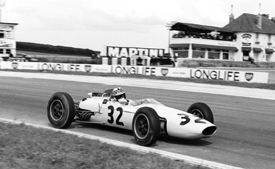 Well-regarded American, Harry Schell, was signed up for 1960 but was killed when he crashed a BRP-entered Cooper in practice for that season's International Trophy at Silverstone. The team dropped out of grand prix racing in 1965 after it was not granted membership of the F1 constructors' association. This was ostensibly because of question marks over whether it manufactured enough of its own parts. Following a brief dalliance with the Indianapolis 500, BRP closed down after aspirations to return to F1 failed. Gregory was also a credible driver in his own right, achieving some success in 500cc racing although this was always on an informal basis squeezed between his other commitments. 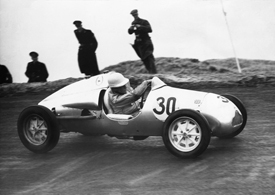 His racing exploits included outings in machinery produced by Kieft, of which Gregory was a director. He later became involved in running charter aircraft and in publishing, notably starting up Cars and Car Conversions magazine.